After spending a summer in the Italian countryside, the country stole my heart immediately. I fell in love with the people, the laid back lifestyle and naturally the food. Italians have an uncanny ability to appreciate the simple things in life – whether it’s picking fresh figs from the garden, sipping wine from tumblers in the front terrace or devouring velvety strips of papardelle, it’s all about the simple and tasty pleasures. I passed hurriedy through the Emilia Romagna region en route to Tuscany so unfortunately had only a brief taste of what this region had to offer. Often referred to as the “heart of Northern Italian food”, this region is home to some of the best cold meats and cheeses in the world and is the only region in Italy where Parmigiano Reggiano cheese is produced. 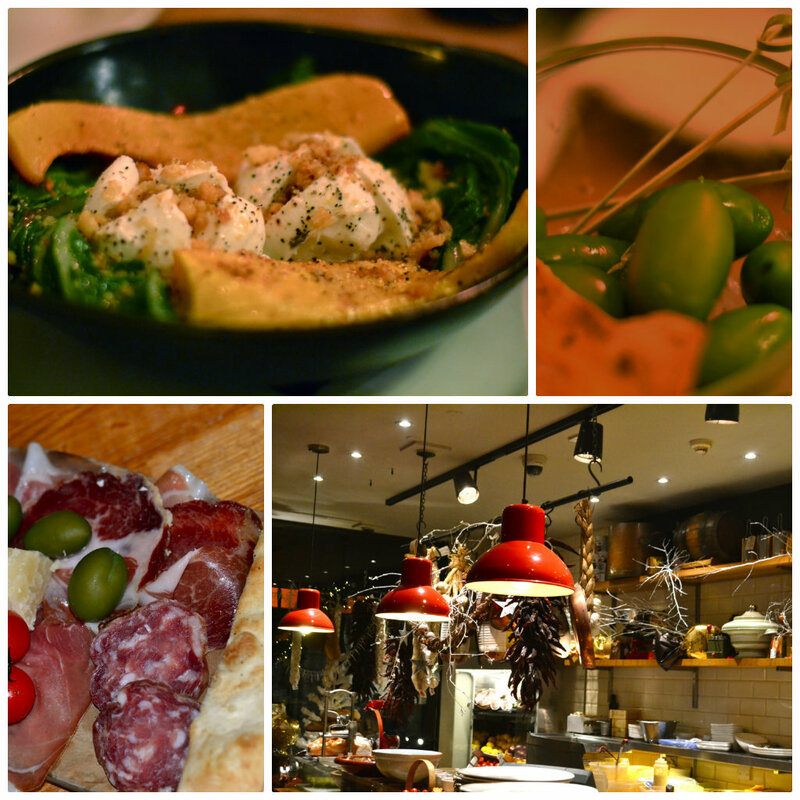 So when I was invited to try Ponti’s Italian Restaurant in London’s West End to taste their authentic Emilia Romagna cuisine I was intrigued. 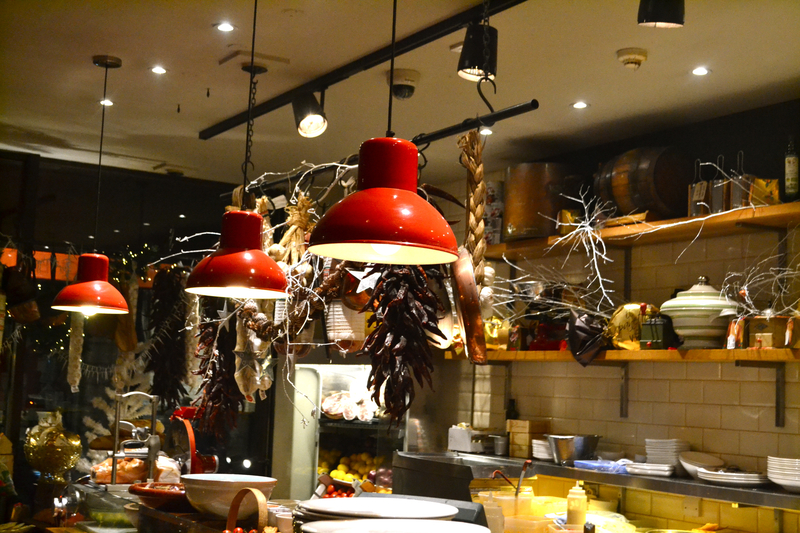 Ponti’s is an atmospheric venue in central London and a welcome oasis from the hordes of angry shoppers on Oxford Street. In typical Italian fashion, a variety of meats and herbs suspend from meat hooks in the open kitchen and platters of fresh produce tantalize the taste buds of hungry diners. A family-run restaurant since 1963, the owners originate from the Piacenza region, renowned for its great food and specialty produce. Simplicity and taste is the winning combination that makes the cuisine of this region so special. As part of the 50th anniversary Christmas menu, we were treated to a gut wrenching 8 course tasting menu. We started with a bowl of juicy plump olives from the Emilia Romagna region accompanied by a zesty black olive tapenade which we slathered on wafer thin flat bread. The roasted butternut squash and buffalo mozzarella was superb, served on a bed of wilted greens and topped with tiny balls of crispy parmesan breadcrumbs for added texture. Parma ham scallops were beautifully marinated in a naughty lashing of garlic butter then wrapped delicately with parma ham. If this was not enough ham for the evening, our eyes exploded when we saw the antipasto plate arrive – filled with an array of Emilia Romagnana meats including salame piacentino, coppa and Parma ham served with aged parmesan, cherry tomatoes and Sardinian flat bread. The winning dish of the night was an Emilia Romagna specialty – delicious parcels of ravioli stuffed with spinach and ricotta. The pasta was cooked al dente and had a beautiful velvety texture. The dish was made even more heavenly by a small bath of sage butter coating the ravioli. The oven roasted chicken was beautifully tender and served with typical Christmas accompaniments like roast potatoes, gravy and cranberry sauce. 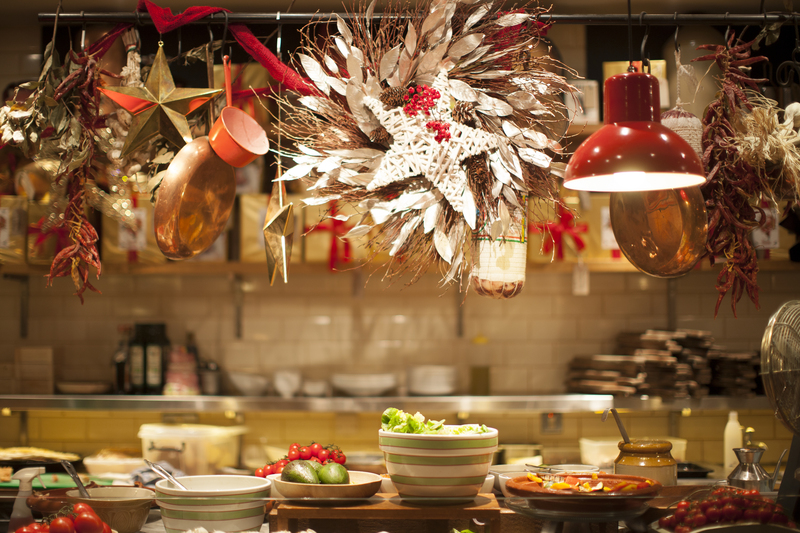 For an Italian restaurant, this dish felt out of place – even for a Christmas menu. We just managed to loosen our belts and squeeze in small portion of the desserts. I guess no Christmas menu is complete without a traditional Christmas pudding. 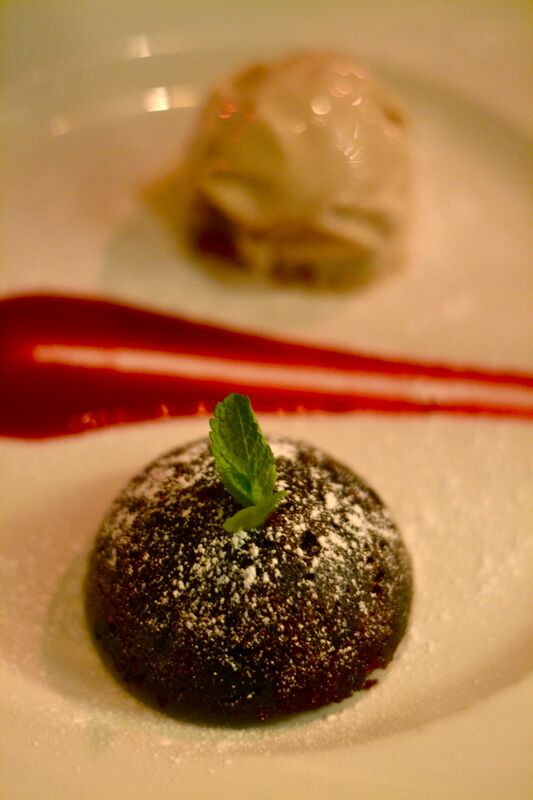 It was all that a pudding should be – rich, fruity and boozy. Unfortunately I’m not a huge fan of Christmas pudding, so I left my limited room for the next dessert – Bombolini di Ricotta. 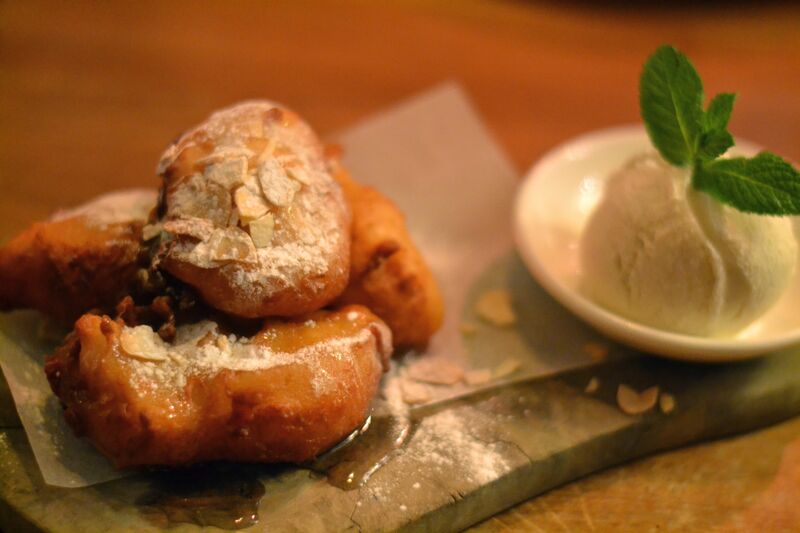 The golden battered Italian doughnuts were brilliantly executed, bathed in a syrupy mess of acacia honey and filled with sweet ricotta. The home-made vanilla pod icecream was a delicious accompaniment for these delicious parcels of goodness. Nearly two bottles of red wine later, the lovely Leyla and I came away full, satisfied and with a growing travel bug to explore Italy. And with service with a smile, you may even forget you’re in central London. It’s not the best Italian I have had by any means but it’s definitely a good retreat to recover from a bout of pedestrian rage in Oxford Street. 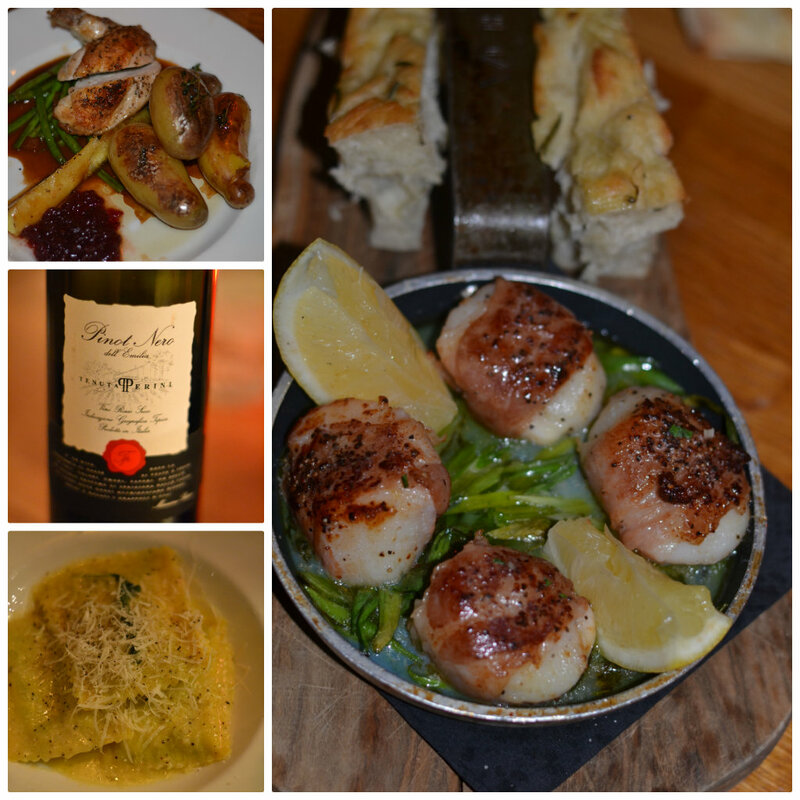 I was a guest of Ponti’s for this review. I love the first photo; it’s just how I want my kitchen to look! An organised chaos! It’s very clever how you take your restaurant photos. Usually I’m so desperate to eat or the people I’m eating with are getting impatient, so it’s usually a very quick snap and not great quality. It certainly sounds like it is worth a try….next time we are in London we will give it a go. Ponti’s just looks the part too – oh how I love everything about italy!